The Bernina Bernette 65 is a sewing machine designed for easy handling and loaded with features that are helpful to beginners, such as an automatic needle-threader, a one-step buttonholer and a drop-in bobbin system. A reference guide is located on the machine, making it fast and easy to locate the dial for the perfect stitch. Plug in your sewing machine. 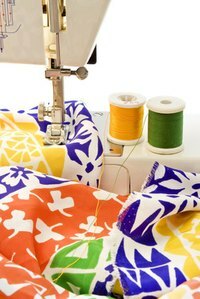 Make sure that it is on a stable work surface with plenty of room for working with the fabric. Turn on the machine. Slide the bobbin into the bobbin unit. The unit is located near the sewing machine foot, which holds the needle. The bobbin unit on the Bernina Bernette 65 is a top-loading bobbin and is marked with arrows indicating how it should slide in. Slide the cover back over the bobbin once it is loaded. Thread your machine. Secure your choice of thread to the thread holder on the top right Thread it through the machine following the arrows. Press the lever located near the needle to use the automatic needle-threader. Refer to the built-in quick reference guide located as a slide out along the base of the machine. Choose a stitch type and set your dial for that stitch. Place your fabric along the rulers and under the needle. Manually move the needle into the fabric where you plan to begin sewing. Move the presser foot into the down position, where it is in contact with the fabric. Press the foot control to begin sewing. This model has a feed-dog-drop lever for free-motion sewing. All Bernette sewing machine models have removable extension tables for easier access to the free arm, making it easier to sew sleeves or tube-shaped items. For a decorative border, the Bernette has a 5-mm stitch width.